Rockstar has announced L.A. Noire for PlayStation 4, Switch and Xbox One. Those who own a HTC Vive will see self-contained cases from the game released. L.A. Noire will be released on the consoles and HTC Vive November 14, proving rumors from earlier in the year to be true. The Switch version of the title is the complete, original game and comes with all downloadable content. It has been enhanced to include a Joy-Con mode with gyroscopic, gesture-based controls, HD rumble and new wide and over-the-shoulder camera angles. It also includes contextual touch screen controls so players can take it on-the-go. It’s been eight years since Rockstar released a title for a Nintendo system, the last being Grand Theft Auto: Chinatown Wars in 2009, so this is great news for Switch owners. L.A. Noire for PlayStation 4 and Xbox One is also the complete version with previously released DLC. It has been updated to include enhanced lighting and clouds, new cinematic camera angles, high resolution textures and more. It also plays natively in 1080p for both consoles as well as 4K for PS4 Pro and Xbox One X.
Downloadable content for L.A. Noire, which was originally released on PC, PS3 and Xbox 360 in 2011, includes the following cases and extra content: the Broderick and Sharpshooter Detective Suits, Badge Pursuit Challenge and Button Man Suit, the Naked City Vice Case, a Traffic Case called A Slip Of The Tongue, the Nicholson Electroplating Arson Case, the Vice Case Refer Madness, and a Traffic Case titles The Consul’s Car. L.A. Noire: The VR Case Files for HTC Vive will contain seven, self-contained cases from the game rebuilt specifically for virtual reality. It’s the first VR title to be released by Rockstar. Information on these cases were not available as of press time, but we’re looking into it. 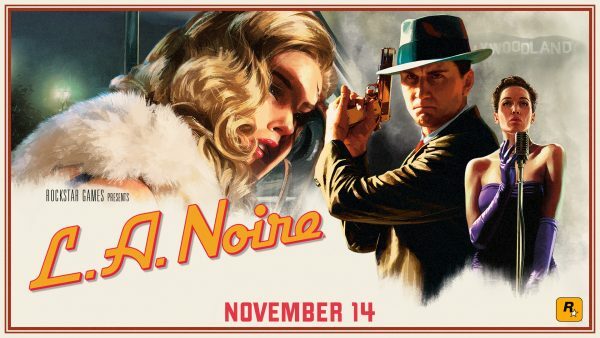 Again, L.A. Noire will be released on the aforementioned platforms November 14. It will be available through both digital and retail. We’ll provide more information when it becomes available.